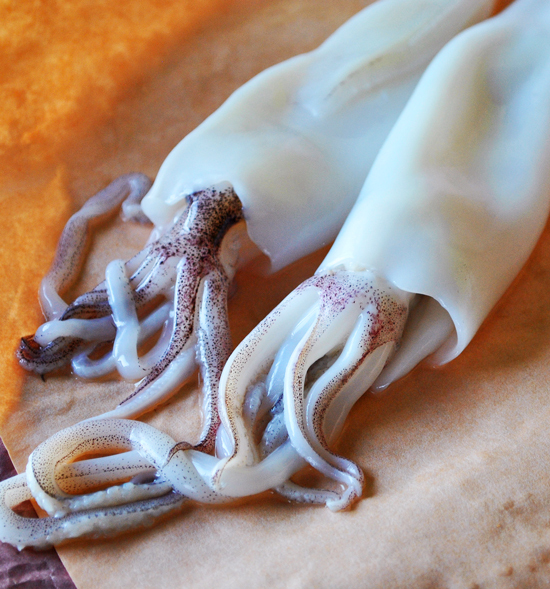 Squid isn’t for everyone, but those who like it, generally love it– I am one of those people. In the summer, I make this dish as an appetizer; its perfect for entertaining and pairs really nicely with a cold blond beer. In the colder months, I toss this in a fresh pasta. 1. Most grocers sell calamari cleaned (innards and ink removed); if, however, your calamari needs to be cleaned, follow these instructions. Create a salt scrub (1 tbsp water, 2 tbsp coarse salt), and for the lack of a better term, exfoliate the body of the calamari until it is white and all the color is removed. Rinse under cold water. 2. 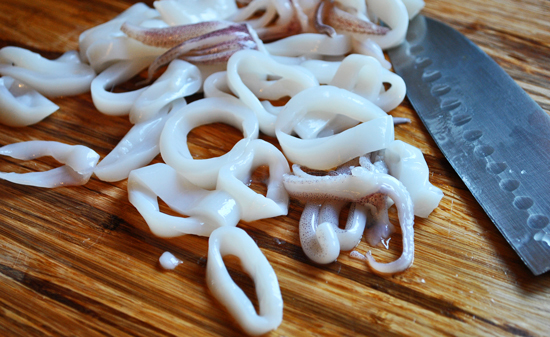 Using a sharp knife, cut cross sections across the body of the squid– you’ll end up with calamari rings. 3. 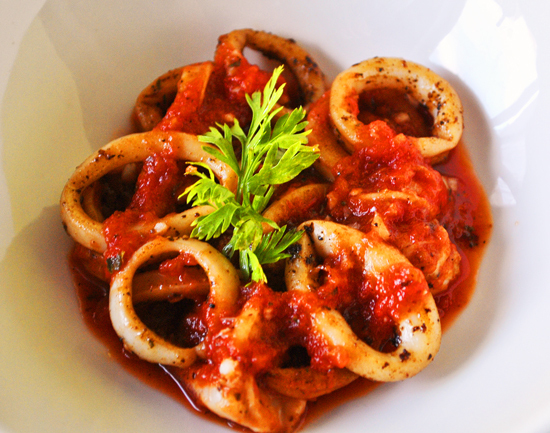 In a medium bowl, combine remaining calamri marinate ingredients; add calamari, cling wrap the bowl, and refrigerate. 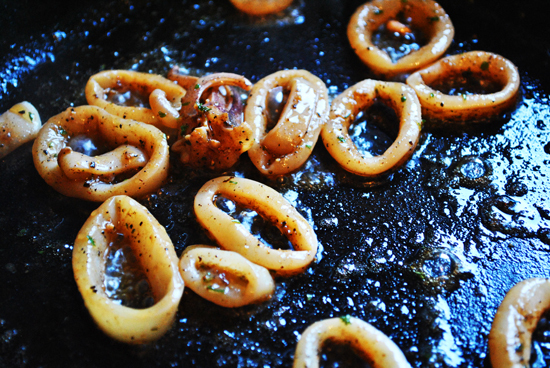 You’ll want to marinate your calamari rings for a minimum of 30 minutes. 4. 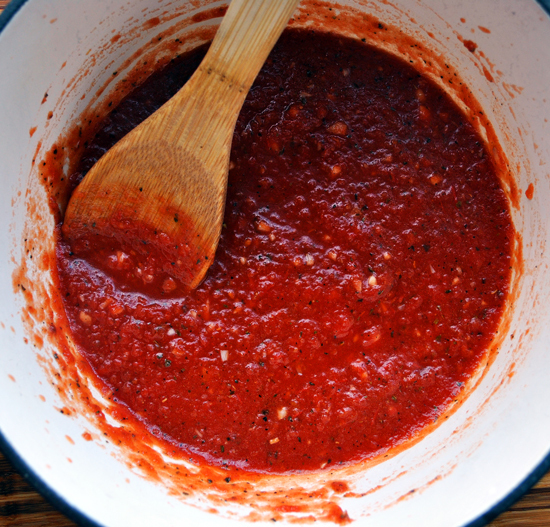 While the calamari is marinating, make the Arrabbiata sauce: In a medium sauce pan, heat olive oil on medium heat. Add garlic and simmer for 2 minutes, taking care not to burn the garlic. Add crushed tomatoes, hot pepper, salt, pepper and basil. Reduce heat to low, and cook for 20 minutes. 5. Heat a large skillet, preferably cast iron, over medium heat until it gets HOT. Coat pan with 2 tsp cooking oil to prevent sticking. 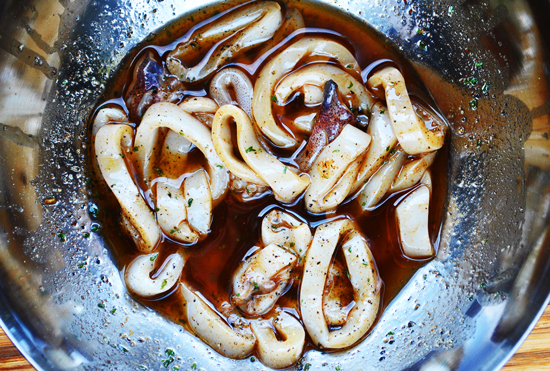 Drain any remaining marinade from the calamari rings, and spread the squid pieces in the pan and cook, tossing once or twice for a maximum of 1 1/2 minutes. Over cooking the rings will make them gummy and rubbery– you definitely don’t want that. 6. 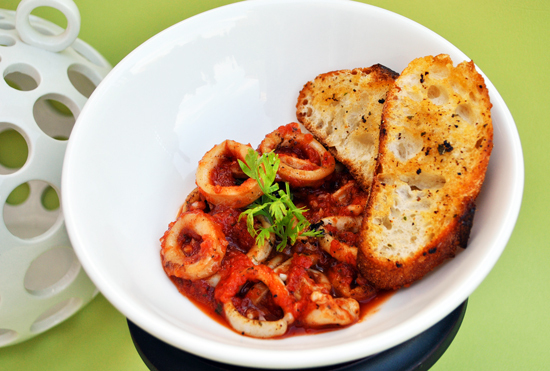 To Serve: Plate calamari and ladle the Arrabbiata sauce on top– pasta is optional . Garnish and serve with garlic crostini. thanks for sharing it with us.your pics look amazing. Looks delicious! I love calamari at this time of year. I’ve never had squid before and the thought of it has always make me squirmish, but I’m looking at the raw cut squid and it has me memorized. I don’t know. I find it beautiful. The color, the texture, the freshness. Someday soon, I will have to try calamari. Hello it’s me Fiona, I am also visiting this site daily, this site is actually fastidious and the users are actually sharing nice thoughts.